Richard Lange's latest dives headlong into L.A.'s dark waters. Californian Richard Lange (Dead Boys) has written a taut, sure-footed walk on L.A.'s wild side with This Wicked World (Little, Brown)--certainly not of the city of angels and movie stars, but the metropolis of hopeful and exploited immigrants, low-life hustlers, psychos, and all stripes of humanity in between. Playing the lead in this morality play is ex-Marine, ex-con Jimmy Boone, born and raised to a hardscrabble life with an alcoholic mother and all the baggage that carries. Boone fulfills fellow Californian Raymond Chandler's view, enunciated in his essay "The Simple Art of Murder": "Down these mean streets a man must go who is not himself mean." We find out Boone's crime was a setup and meet him as he tries to serve out his parole as a barkeep at the Tick Tock, a Hollywood Boulevard tourist joint, and becomes embroiled in finding out what led to illegal Guatemalan Oscar Rosales's death on a city bus. What follows includes a toothless pitbull and a glimpse of the dog-fighting world, a sociopathic stripper and her pathetic dipsy brother, an ex-cop turned school teacher, a cache of near-perfect counterfeit Ben Franklins, an assortment of thugs, killers, and creeps, and some nice desert scenes. Lange handles the Southern L.A. setting with gusto and the action with alacrity. This Wicked World's cast is surely tilted toward the dark side, which makes some part of Boone's predicament and responses too good to ring true. 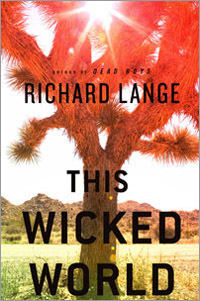 What is true is that Lange has talent--and his debut novel is a wicked promise of more to come.